Today, we’re featuring another favorite French snack sure to be enjoyed by your loved ones — the pain au chocolat (chocolate croissant). French bakeries are stocked up with fresh pains au chocolat around 4pm when children typically get their snacks in France — or their “quatre heure” (four o’clock) as it is also called. Pains au chocolat, like madeleines, fill the memories of children and their mother or grandmother who often get this treat for them at the local boulangerie (bakery). In France, it is so prevalent and cheap too that I never make them when I am over there. But when I am in the US, first it’s hard to find a real pain au chocolat and then when you find one, it is often so expensive. So, I prefer to make my own homemade pain au chocolat using the Art of the Home recipe below. Enjoy and bon appétit! 8 chocolate sticks (e.g. dark chocolate). Pre-heat oven 400 °F (about 200 °C). Place 2 chocolate sticks on each rectangle, just like this baker does in the 1 clip below. 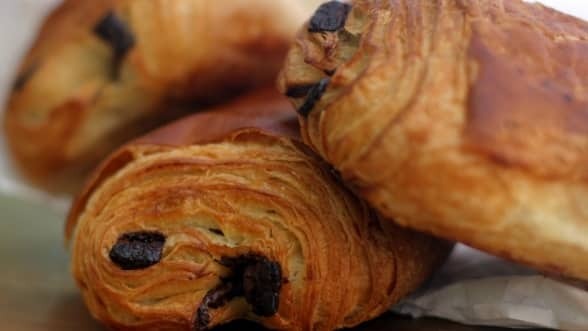 There are 2 methods – the 2nd one is the more traditional one and will give you a fluffier pain au chocolat. In both cases, you want to make sure the fold is facing down so your petits pains au chocolat don’t open up during baking. You also want to be sure not to glaze the sides. In a small cup, mix the egg yolk with about 1-2 TBSP of water. With a food brush, spread the egg yolk mixture on each petit pain au chocolat (it will give them that rich golden color when they are done). Bake the pains au chocolat for 15 minutes or until they are golden brown. Remove from cooking sheet and let cool for about 15 minutes before serving. Serve warm or cold. Chocolate substitution: you can line the dough with chocolate chips if you don’t have chocolate sticks handy. Your pains au chocolat will be delicious too. Big crowd: double up the croissant dough and chocolate and make 8 pains au chocolat. No need to double up the egg yolk, it is enough for 8.